How to create user authentication using Node.js, Express.js, Mongoose.js and Passport.js with simple application example. This tutorial is how to create user authentication in the Node.js application with the combination of Express.js, Mongoose.js, and Passport.js. All of that libraries, modules, and dependencies is ready to use in Node environment. And we will use Jade as template engine with Bootstrap 3 as responsive CSS framework for making styling fast and easy. As usually, let's jump to the tutorial. We assume that you already installed all required tools like Node.js and Express.js application generator. Open terminal or cmd then go to projects folder and run this command. Different with previous Node.js tutorial that now we are not using '--ejs' prefix because now, we will using 'jade' as template engine that comes as default Express.js application generation. Go to the newly created folder then install npm module. And here is generated application project structure. Now, you can run the application to make sure everything working properly. You can use one of the commands below. If you see this page, that would be easy to continue to the next steps. Now, we have to add database ORM/ODM for connection Node.js application with MongoDB database. For that, type this command after you stop the application. For Passport.js we have to run this command. We have to install Express-Session too for storing authentication token in cookies. Open and edit app.js from the root of the project folder. Add Mongoose.js to 'require' and call connection to MongoDB. Add require for passport and passport-local. In 'app.use' section add this lines for initialize passport and express-session. Now run again the application, but don't forget to run MongoDB server in another terminal tab. If you run again your application and see the message below, then your application mongoose configuration is ok. This time to create models for authentication requirement. Create new folder in the root of project folder then add file for User Model. Open and edit models/User.js then add this lines of codes. To control access from views to models and vice-versa, we will create Controller for authentication. This is just implementing basic MVC pattern. Create controllers folder then create controller file on the root of project folder. Open and edit AuthController.js then add all these lines of codes. We need to create routes for authentication mechanism. Open and edit routes/index.js then add this all lines of codes. Now is the time for creating user interface or views. Open and edit views/layout.jade then add bootstrap for styling view via CDN. 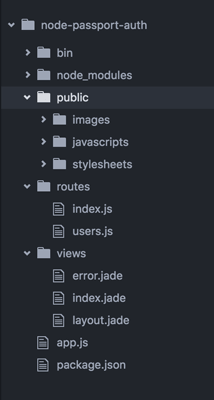 Open and edit views/index.jade then replace all codes with this. Create new files for login and register form. Open and edit views/login.jade then add this lines of codes. Open and edit views/register.jade then add this lines of codes. Next, we have to do a little styling for this views. Open and edit public/stylesheets/style.css then replace all code with this. Finally, we have to try and run the application to see if all functionality is working fine. Open a browser and point to 'localhost:3000'. You should see this page on the browser. You can start register then it will automatically log in. Full source code on Github. 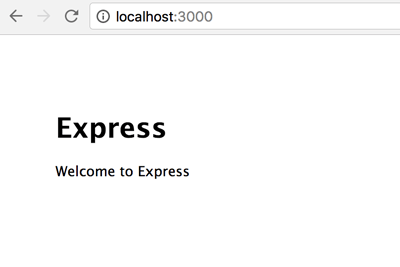 This tutorial uses basic Node.js and Express.js with help of Mongoose.js, Passport.js, and Bootstrap. Feel free to give us input or suggestion in the comment below.